Like poultry and meat, whole fish work well in a one-pot casserole brimming with winter veg. If the vegetables are sweated for a while first, they can finish cooking in the time it takes a couple of nice whole fish to cook through, and lend their delicious juices to the dish. Put the butter and olive oil in a large flameproof casserole over a medium-low heat. Add all the vegetables, season well and toss them in the fat, then sweat gently for about 10 minutes, until they begin to soften. Don't let them colour. 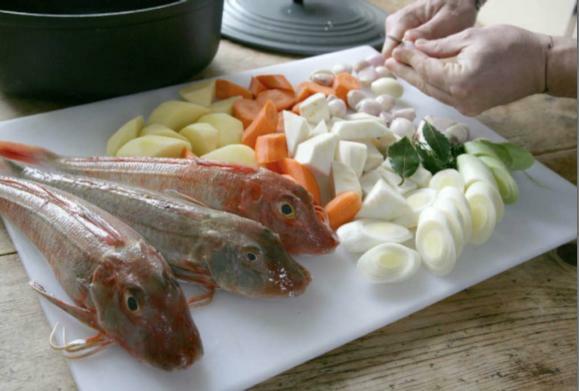 Season the gurnard with salt and pepper, then add it to the pan, pushing it down so it is snuggled in among the aromatic vegetables. Sprinkle over the wine and a glass of water, tuck in the bay leaves and cover the dish. Bring to a gentle simmer on the hob. Now transfer the casserole to an oven preheated to 180°C/Gas mark 4 and bake for 30-40 minutes, depending on the size of fish. To check that the fish is ready, insert the tip of a knife at the thickest part to pull the flesh away from the bone. It should be opaque all the way through. If you have one or two larger fish, take the flesh off the bones in big chunks.Otherwise, simply serve one fish per person, with plenty of the vegetables and juices alongside.